Can you believe that it's 80 degrees in L.A today? Normally, that's no big deal, but it's February! Time to cool down with a decadent little snack. This would also be a perfect snack to impress your guests with during the Oscar's this weekend, hello people! The tomatoes on this crostini are roasted ahead of time, and then chilled. You could do this the night before if you wanted to. The cheese is burrata mozzarella, a very rich version of regular mozzarella chese made with cream. You can get it at most supermarkets in thier specialty cheese section. Preheat oven to 350 degrees. Place all tomatoes onto a medium sheet tray and lightly drizzle with olive oil, salt and pepper. Place sheet tray onto middle rack of oven and allow to roast for 15-20 minutes unti lightly blistered. Remove from oven and allow to cool. In a food processor, place basil, parmesan, pine nuts, garlic, lemon and a heavy dash of salt and pepper. Lightly pulse until roughly chopped, then drizzle in olive oil at a slow rate until desired consistency is reached. For a chunky pesto add less oil, for a smoother, more liquid consistency add more. 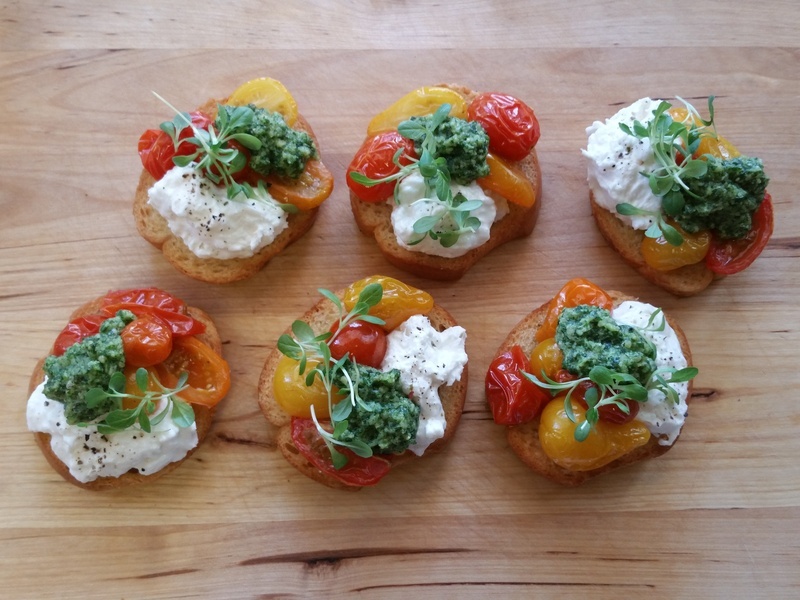 Place burrata onto crostini and finish with tomatoes. Top with pesto, and garnish with basil, microgreens, or basil. A healthy drizzle of balsamic vinegar is also warranted in this situation. 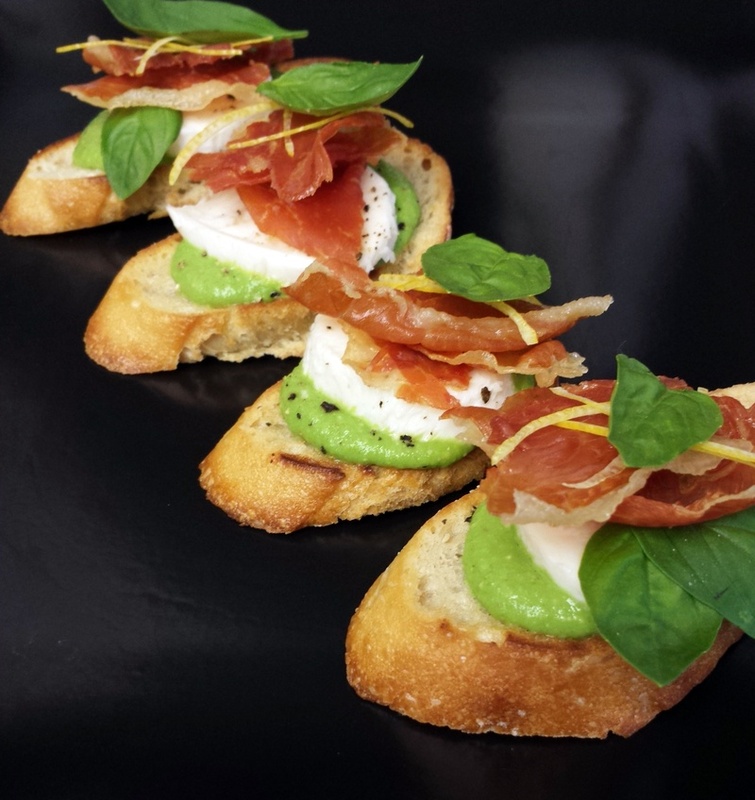 These Crispy Prosciutto, Mozzarella and Basil Spring Pea Puree Crostini's are everything I love about Spring! If you cannot find fresh peas in your local grocery store, you can always use frozen. Pre-heat your oven to 375. Brush a large baking sheet with one tablespoon melted butter. Top baking sheet with slices of french bread. Brush the top of each slice with the other 2 tablespoons of melted butter. Bake in oven for 10 minutes, or until golden brown and crunchy. Remove slices from oven and allow to cool. On another baking sheet, lay out each prosciutto slice flat. Bake in oven for 10-15 minutes into crunchy. Allow to cool. In a blender, blend 1 cup peas with 2 tablespoons water and 2 tablespoons basil. Season with salt and pepper to taste. 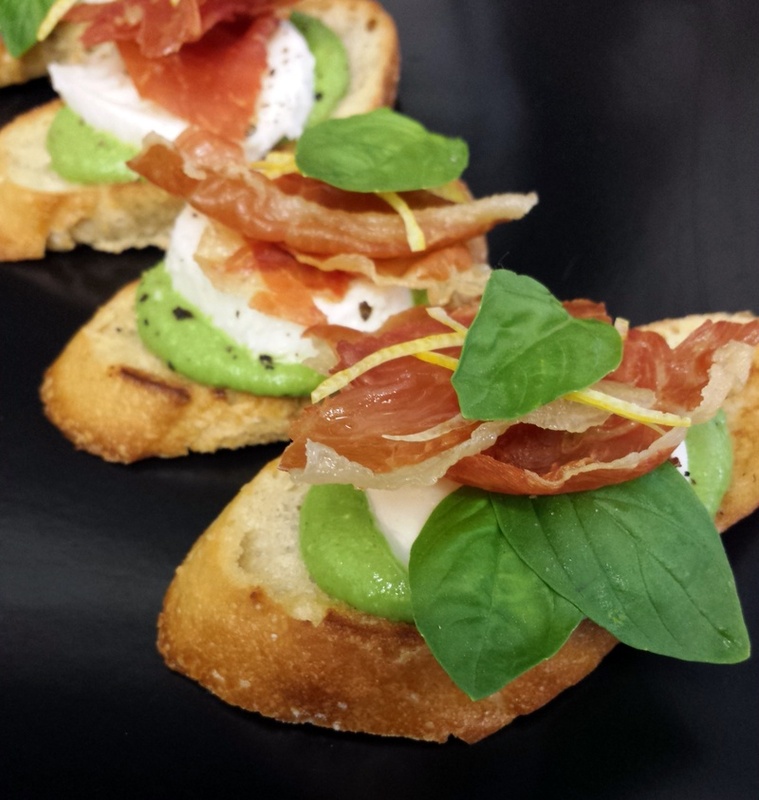 Top each crostini with a tablespoon of the pea puree, then top with one slice of mozzarella. Season with salt and pepper. Then top each crostini with 1 or 2 slices of crunchy prosciutto. Finish with lemon zest, basil leaves and extra virgin olive oil. 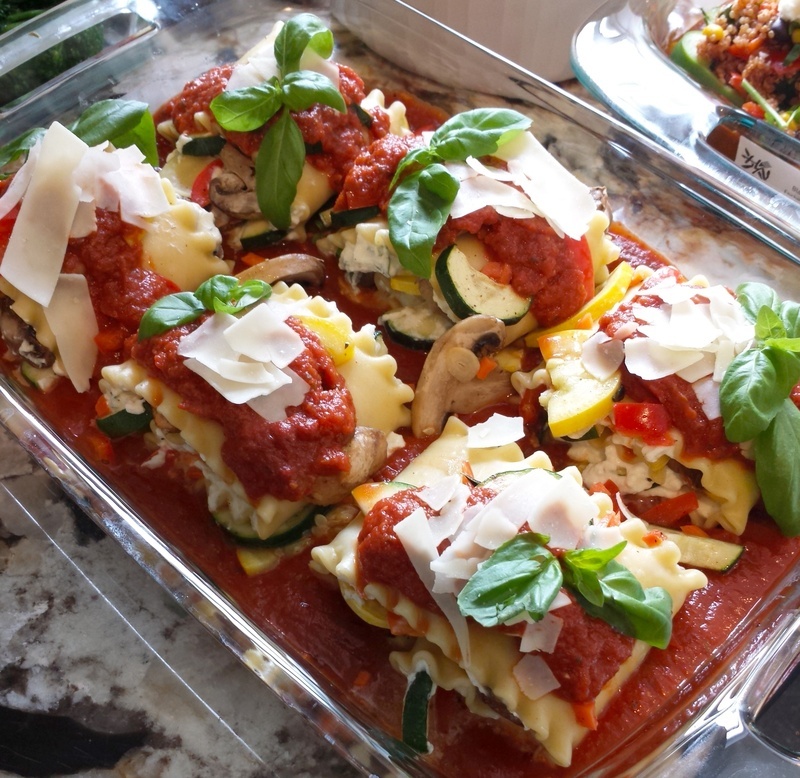 These Roasted Vegetable Lasagna Roll-ups are great for anyone who doesn't feel like assembling an entire lasagna! Also, don't limit yourself to the ingredients I have shared below, you could add a multitude of different vegetables or proteins! In a medium stock pot, heat 1 tablespoon olive oil over medium high heat for 1 minute. Add onion and garlic to pot and saute for 3 minutes until translucent. Add tomato sauce and tomato paste to pot and bring to a simmer. Simmer sauce over medium low heat for 40 minutes. Add 1 tablespoon basil and oregano to sauce. Season with salt and pepper to taste. Reserve sauce on back burner. Pre-heat your oven to 375 degrees. Drizzle 1 tablespoon olive oil onto a large sheet tray. Place chopped zucchini, squash, mushrooms, carrot and bell pepper onto sheet tray and season with dry italian herbs, salt and pepper. Place sheet on middle rack of oven and roast for 20 minutes. In the meantime, in a medium mixing bowl place ricotta, 2 tablespoons of fresh chopped basil and 1/2 tsp garlic salt. Mix and season with salt and pepper to taste. Once your vegetables are done, allow them to cook for 10 minutes or so. On a clean cutting board, lay out one cooked lasagna sheet lengthwise. Scoop 1 tablespoon or so of ricotta mixture with a spoon and spread evenly over one side of lasagna noodle. Then, evenly place one or two sliced of evgetables the entire way down the roll. Be sure not to over stuff the rolls. A layer or two of vegetables will be fine and you can use the extra veggies later on. Once the entire roll is evenly cvered, place 1 or two slices of fresh mozzarella onto both ends of the roll. Then, roll those lasagna noodles up like a rug. It may get a little messy, but try to keep as much in the roll as possible. Place finished rolls to the side. In a large baking dish, spread out your tomato sauce evenly amongst the pan. Be sure to save a cup of sauce or so for the top of the roll-ups. Place each roll up on top of sauce. Top each roll-up with any leftover vegetables and/or more mozzarella if you would like. Lastly, finish each roll-up with 2 tablespoons or so of sauce. Cover Roll-ups with aluminum foil and bake for 20 minutes at 375. Remove foil and broil for an additional minute or so if you would like a browner, crispier lasagna roll! 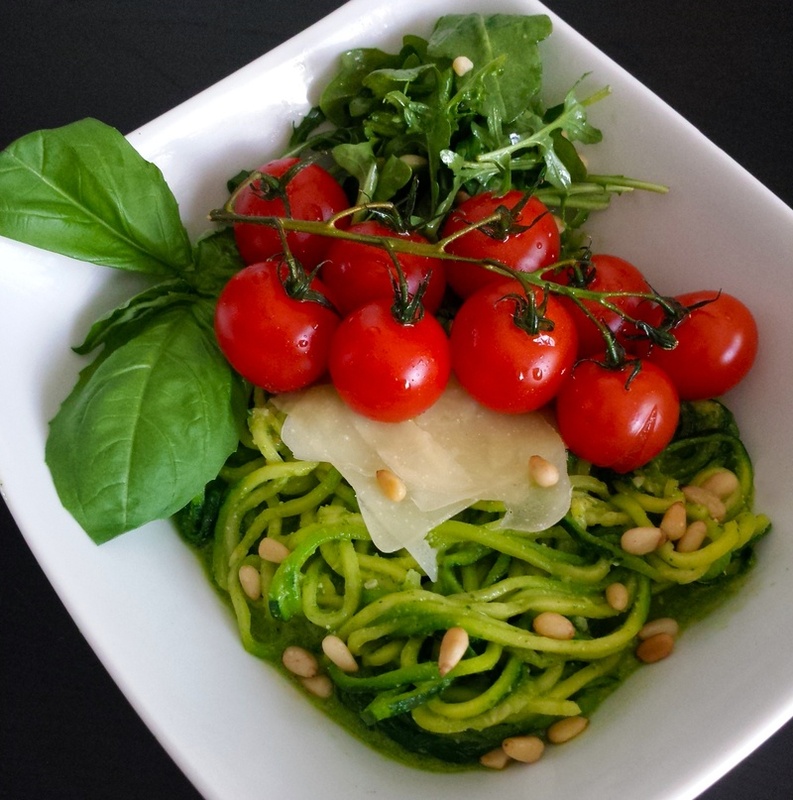 I've really been trying to cut back on my carbohydrate intake lately, so I created this lovely Zucchini Noodle Dish with an Arugula Pesto and Roasted Cherry Tomatoes. It definitely satisfied my craving for pesto pasta without me feeling like I've ate an extra 600 calories. This dish is vegan, paleo and gluten-free if you omit the cheese, but I will not give up my cheese.. Put all ingredients (garlic, basil, arugula, parmesan and pinenuts) except for olive oil into blender. Start blending ingredients while slowly adding olive oil to mixture. Continue to blend and pour until you have a smooth, bright green mixture. Season with salt and freshly cracked pepper to taste. If you would like your pesto a bit thinner, simply add more olive oil. Pre-heat oven to 375. Roast your cherry tomatoes on a small sheet pan in the oven for 5 minutes, then remove and allow to cool. 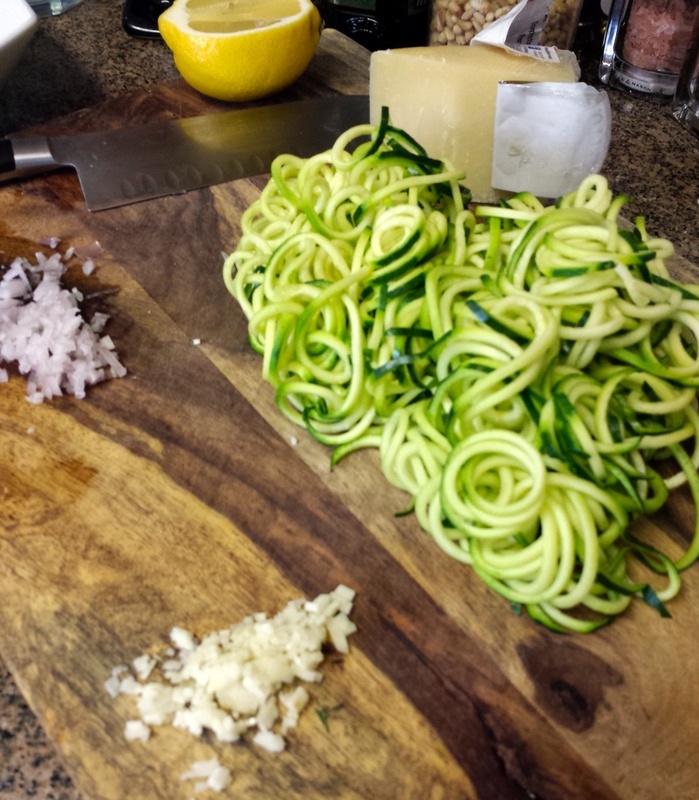 With a spiralizer, spiralize your zucchini until you have a decent amount of "pasta." 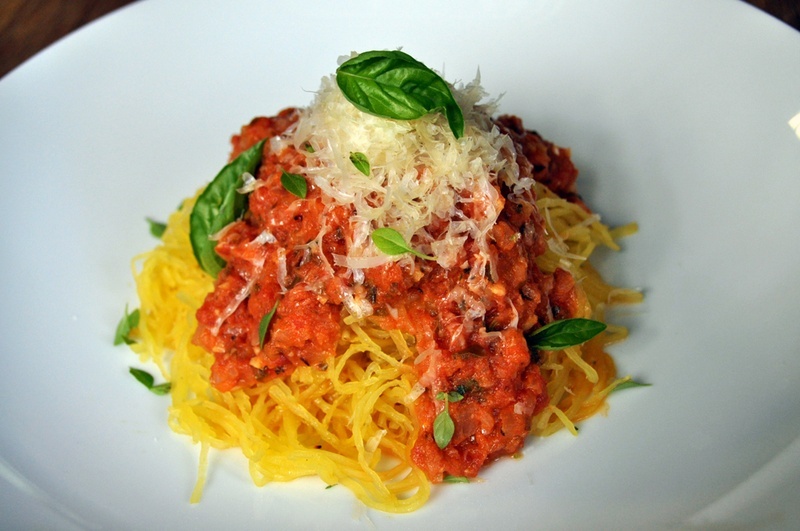 What's a spiralizer? It's like a fancy grater that makes all kinds of fancy cuts that would take you hours with a knife. You can buy one here: http://www.williams-sonoma.com/products/paderno-sprializer/ or at most high end culinary stores. Keep in mind the zucchini noodles will wilt and shrink a bit, so make a bit more than you would be satisfied with. Pre-heat a medium saute pan over medium heat and add olive oil, garlic and shallot. Cook until aromatic, for 1 minute or so. Add zucchini noodles to pan and saute for 2 minutes. Don't allow them to cook for too long, they will continue to cook even when you remoe them from the pan. Season with salt and pepper and remove from heat. Add 1 or 2 tablespoons of your pesto mixture to your noodles and toss with a pair of tongs until coated thoroughly. Place noodles into a bowl and top with shaved parmesan and cherry tomatoes. Garnish with fresh basil leaves or dressed arugula in olive oil. Enjoy! Polenta and mushrooms is one of my favorite comfort food combinations! Try out my Fried Polenta Sticks with Wild Mushroom Ragout and you will understand why. Be careful though, the polenta sticks are addicting! If you are short on time, most grocery stores sell pre-made polenta so you don't have to cook and cool freshly made polenta. Make polenta according to package. Lightly oil a 8x8 baking dish. Gently pour hot polenta into the dish spreading out to 3/4 inch to 1 inch thick. Allow to cool for 5-10 minutes then transfer to refrigerator to cool for 2 hours until firm. Pour 1 tablespoon olive oil into a medium stock pot over medium-high heat. Saute shallot and garlic until translucent, then add button mushrooms, portobello mushroom, oyster mushroom and chantrelle mushroom. Reduce heat to medium-low and "sweat" the mushrooms for 15-20 minutes until cooked thoroughly. Once the mushrooms are soft and fully cooked, add 3 tablespoons of butter to the mushroom mixture until melted. Bring mushroom ragout to high heat and sprinkle wondra flour into mushrooms. Wondra is a very fine flour that is used to thicken sauces and gravies without a roux. It will not impart a lot of "flour" flavor. Stir mushrooms until any sauce in the pot thickens and return ragout to low heat. Add in thyme and parsley and stir until incorporated. Season with salt and pepper to taste. Keep on very low heat until time to serve. Pre-heat your oven to 250. Once your polenta has cooled, cut it into 1 inch by 2 inch sticks. Place a large saute pan over high heat and add 3 tablespoons of olive oil. Gently place each polenta stick into the oil and cook for 3 minutes on each side until golden brown. It is best to do this in a couple of batches to the polenta has room to crisp. Keep your first batch in the oven to keep warm until you are ready to serve. 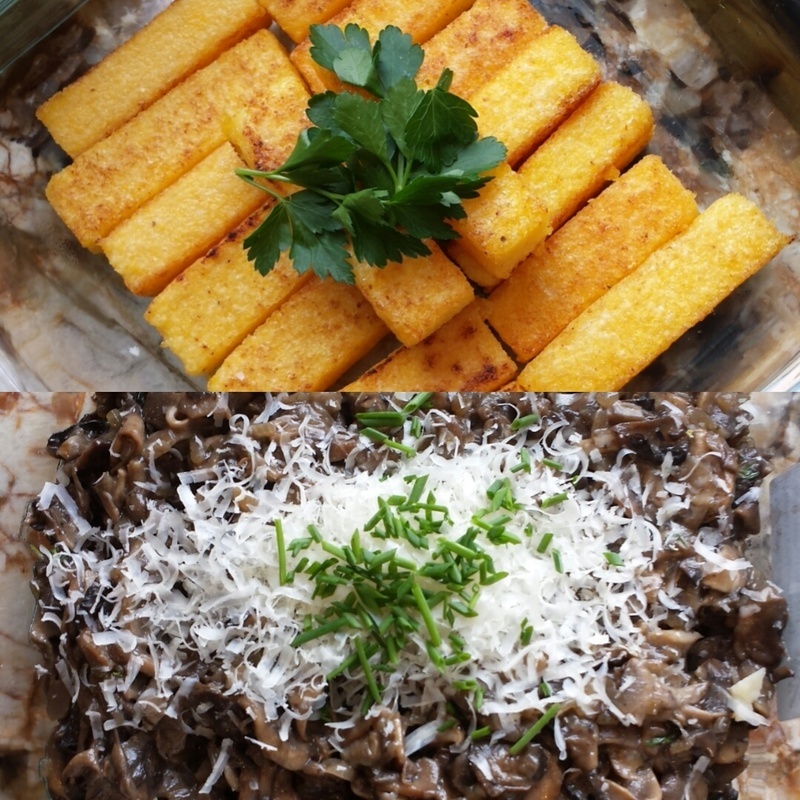 When ready to eat serve, the mushroom ragout over a few polenta sticks, and shave fresh parmesan over the plate. So delicious. I want some now! Did you know that January is National Slow-Cooking Month? One of my favorite slow-cooked dishes is these Burgundy Braised Short ribs. I have written out directions for both Dutch-ovens and crock-pot because everyone has their preference. I served these over a risotto Milanese with some of the braising liquid and vegetables. They would also be wonderful over pureed/mashed potatoes, or pasta! Note: What is Wondra? Wondra is very fine flour that is used in sauces and soups as a thickening agent. Pre-heat oven to 325. In a large dutch oven, heat olive oil over high heat. Season shortribs with salt and pepper, and pat dry with paper towels. Sprinkle wondra/flour over shortribs and coat evenly. This process will help thicken the sauce. Sear shortribs in dutch oven until there is a nice browning on both sides. Turn the heat down to medium if caramelizing too quickly. Once shortribs are browned, remove from pan and hold on a sheet tray. 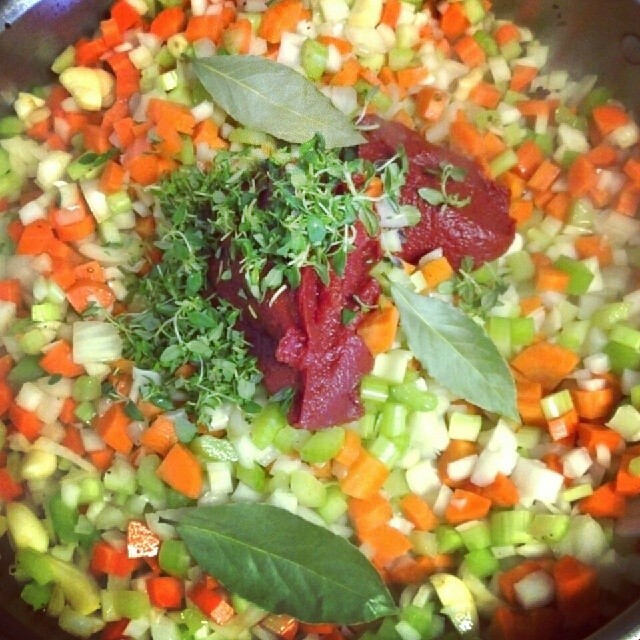 Turn heat to medium on the dutch oven, and add onion, carrot, celery, garlic, bay leaves and thyme. Stir with a wooden spoon, being sure to scrape any browned bits off of the bottom of the pan. Those brown bits = Flavor. Once the vegetables are soft and translucent, add tomato paste and black pepper and stir until incorporated. Cook for 2 minutes to cook-out some of the bitterness from the tomato paste. Turn the heat up to high and add the burgundy wine. Cook wine and vegetables for 2-3 minutes until wine has reduced by half. Add beef stock to pot and stir until all ingredients are incorporated smoothly. Return shortribs to dutch oven and bring to a simmer. Place lid onto pot and place in oven on lower rack for 3-4 hours. Check your shortribs at 3.5 hours or so, they are done when they are fork tender. If they are not done yet, continue to cook in 30 minute increments until tender. Remove shortribs from pot and place on sheet tray. Return shortribs for oven for 20 minutes to caramelize. You will be left with a large pot of liquid and vegetables. Return the pot with the braising liquid to the stove to reduce. *Please use caution as the pot will be very hot! Try to skim the large layer of fat off the top with a large spoon, do your best, it doesn't have to be perfect. Let cooking liquid reduce for 15 minutes and then add butter to finish. Try tasting your sauce. Does it need more salt? Then add some! Season in "layers." It is better to add too little salt, then add more if needed. If your sauce is too thin for your liking, try blending a bit of the vegetables and liquid. It will create a delicious gravy. Serve over shortribs over risotto, mashed potatoes or pasta then spoon sauce over it all and sprinkle with the gremolata.. Yum!! I wish we all had all day to cook but most of us do not. So I have created crock-pot directions for those who want a hot meal to come home to after a long day! Turn crock pot to high heat. Heat olive oil. Season shortribs with salt and pepper, and pat dry with paper towels. Sprinkle wondra/flour over shortribs and coat evenly. This process will help thicken the sauce. Sear shortribs in crockpot until there is a nice browning on both sides. Then, add onion, carrot, celery, garlic, bay leaf and tomato paste. Stir until incorporated, being sure to keep shortribs on the bottom of the crock-pot. Add black pepper, burgundy wine and beef stock to pot. Turn heat to low and slow cook for 8 hours, or turn heat to high and cook for 4 hours, whichever works best for your schedule. Before serving, taste and seaosn with salt and pepper. Add butter to mixture and stir, it will make the sauce extra velvet-ey. If your sauce is too thin for your liking, try blending a bit of the vegetables and liquid. It will create a delicious gravy. 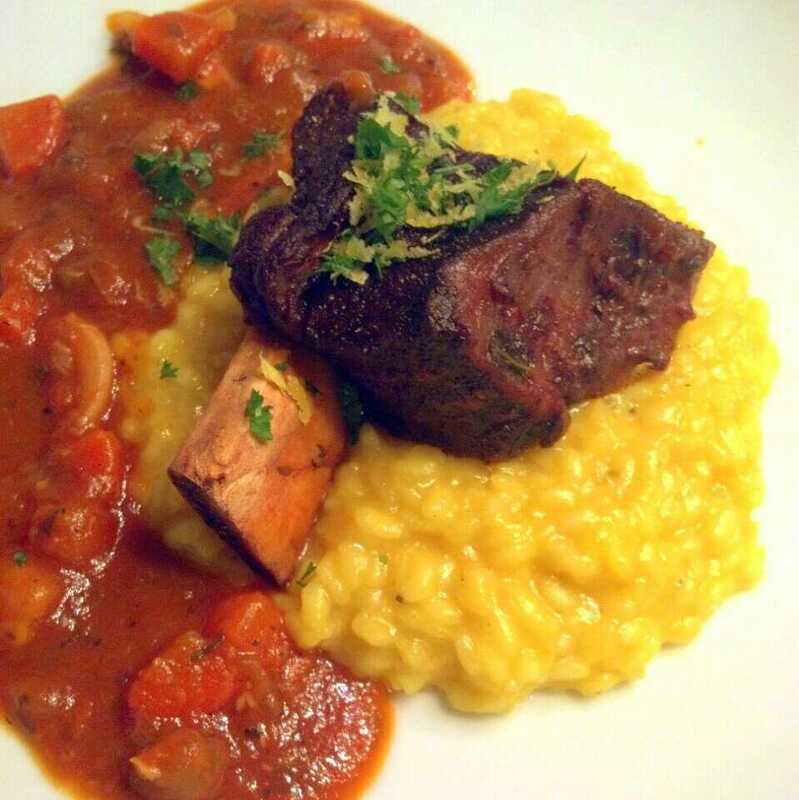 Serve over shortribs over risotto, mashed potatoes or pasta then spoon sauce over it all and sprinkle with the gremolata.. Yum! Mix all ingredients together. Chill in fridge for 30 minutes to meld flavors, and serve over braised shortribs. This comforting Fall recipe is a great for anyone who would like to incorporate a gluten-free, vegetarian or vegan meal into their weekly routine. Pre-heat oven to 375. Place whole squash onto baking sheet and bake on upper middle rack for 1 hour. Be sure to turn squash every 20 minutes or so to prevent the skin from burning. While the squash is in the oven, start your pomodoro sauce. In a medium saucepan heat 1 tablespoon olive oil over mmeidum high heat. Add onions and garlic and saute until translucent. Add canned and fresh tomatoes, stir and bring to a boil. Add 1/4 cup water, basil and oregano and leave to simmer over low heat for 45 minutes. You can either leave the sauce chunky, or if you like a smoother sauce, you can bland it as well. Season the sauce with salt and pepper to taste. Once your timer has gone off fo the squash, remove it from the oven and allow to cool for 10 minutes. Place squash onto cutting board length wise and carefully cut open with a knife. Use caution, as squash will still be hot. Once your squash is halved remove the seeds. Then, take a fork and gently scrape/pull at the strands. Eventually, the strands will break free of the skin and you will have the "spaghetti" for your pomodoro sauce. 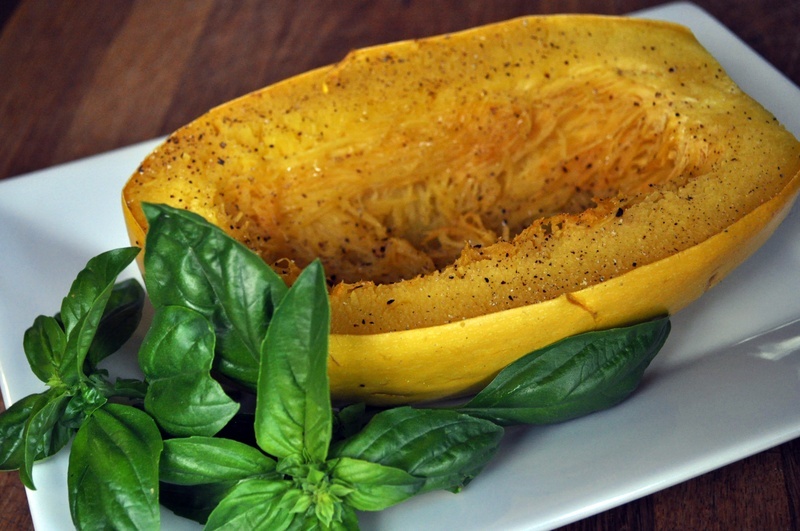 Serve squash warm, top with pomodoro sauce. Garnish with freshly grated parmesan cheese, basil or olive oil. Mangia! 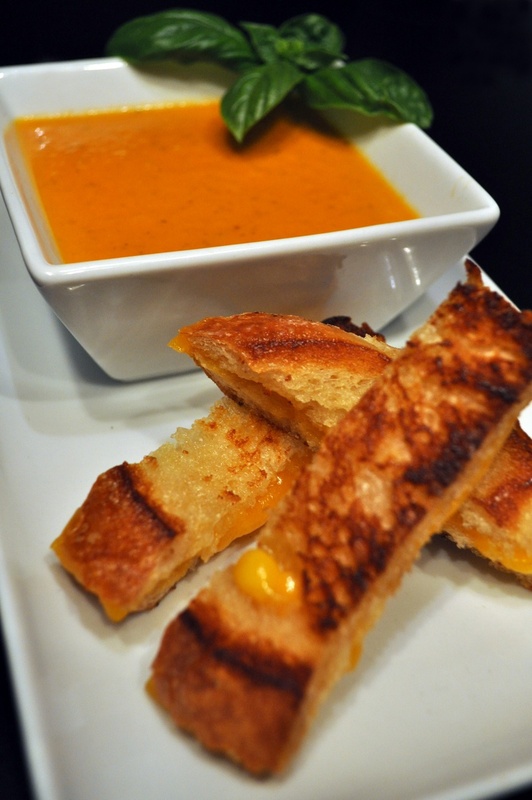 Heirloom Tomato Basil Bisque with Grilled Cheese "Fries"
This grilled cheese and tomato soup combo is great for the kids after school or for the adults whenever they need a simple, comforting meal. Each grilled cheese is cut into quarters so they are perfect for dipping and sharing, or not! Place tomatoes, basil and water into a small sauce pot and bring to a boil. Once boiling, reduce heat to low and cover for 5 minutes. Remove lid, and with a pair of tongs remove all tomato skins from pot (they should peel off easily). Replace lid on pot and continue cooking on low heat for another 5 minutes. Prepare your grilled cheeses by placing two slices of cheese between two slices of bread. Melt butter in a medium sauce pan over medium heat and add sandwich. “Grill” each side over medium heat until golden, toasty and cheese is melted. Remove from pan and place on cutting board to cool. Cut sandwich into quarters. Remove lid from pot, take tomato mixture and blend with immersion blender, or place into blender to blend. Please use caution when blending anything hot. Slowly add cream and blend until smooth. Season with salt and pepper and serve in a small bowl with grilled cheese fries on the side. A simple and elegant appetizer great for any Italian meal or as an hors d'oeuvre at a cocktail party! In total this recipe takes about 20 minutes to make start to finish. The asparagus comes out tender, the proscuitto crispy and the citronette adds the extra acidity this dish really needs. In the photo, I shaved the ends off my asparagus for extra presentation, but it is not necessary. 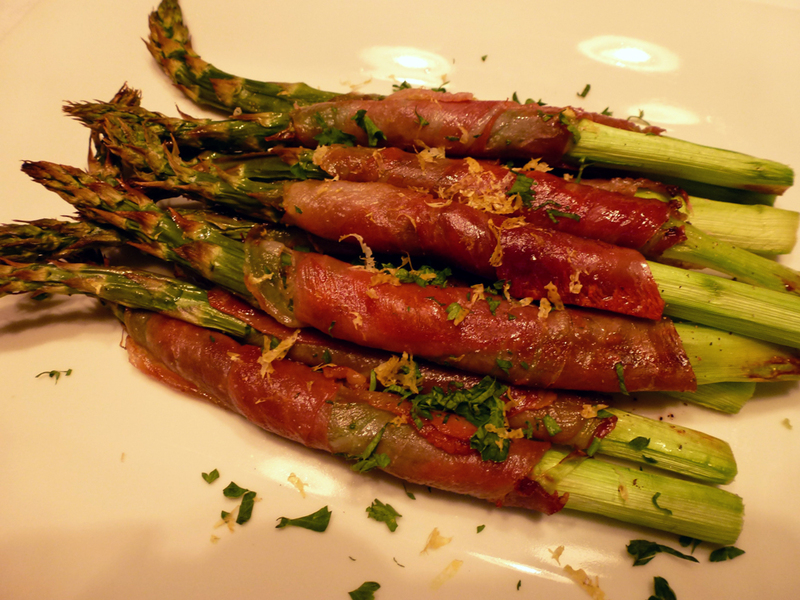 Wrap each asparagus stalk in prosciutto. If there seems to be too much prosciutto for you, simply slice the proscuitto in half and just use less. Place all wrapped stalks on a baking sheet and pre-heat your oven to broil. While you are waiting you can make the citronette. Place dijon and lemon juice in a small mixing bowl. Whisk in olive oil slowly to incorporate it. Season with salt and pepper until desired taste is reached. If citronette is a bit agressive, add 1 tsp water at a time until it softens out a bit. You want this to be acidic though to cut through the richness of the prosciutto. Place baking sheet in oven on the upper middle rack, and keep an eye on it. The prosciutto will crisp up, and the asparagus will become tender in about 5-8 minutes. Do keep an eye on it, you do not want anything to burn. If tray is too close to broiler, simply move it down one rack. Once your asparagus is bright green and your prosciutto is crisp, you are done! Place all stalks on a large plate and finish with citronette, lemon zest and fresh parsley. Season with salt and pepper and enjoy!! 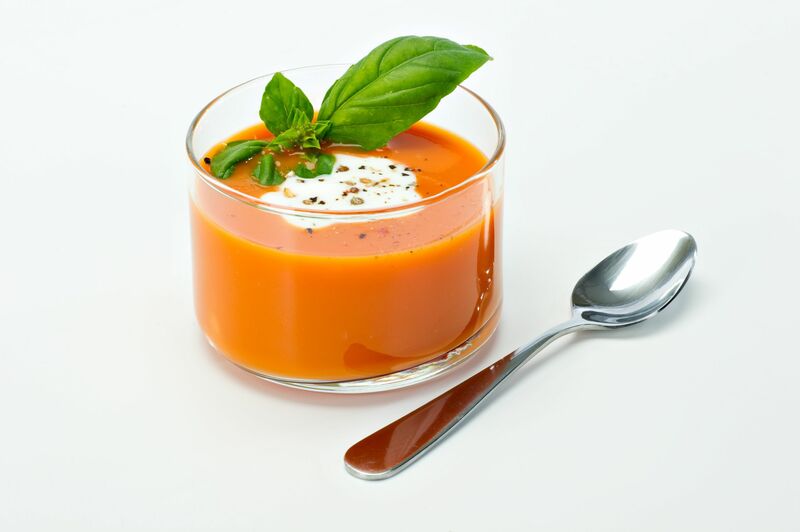 This fresh tomato bisque is one of my all time favorite simple sophisticated recipes. A bisque by definition is a smooth, creamy, highly seasoned soup and that is exactly what this consists of. In a medium saucepot melt butter and sautee onion and garlic until soft. Add tomatoes, tomato paste, water, sugar and basil. Simmer on low heat for 30 minutes, stir occasionally. Allow to cool. Puree 1/3 of the mixture at a time in blender until smooth. Return to saucepot. It is important this mixture has cooled before you add the cream. Slowly stir-in cream and simmer on low heat until heated through. Season with salt and pepper to taste. Garnish with basil leaves and or creme fraiche and serve. Meaning "Brother Devil" in Italian, Fra Diavolo sauce is spicy, robust and full of Italian flavor. A traditional Fra Diavolo sauce is typically made of canned tomato, garlic and chili flakes. I added the bell peppers for a little more depth and flavor. Cook any pasta to near al dente (I used linguine) and finish cooking in Fra Diavolo sauce for 1-2 minutes. This will let the pasta absorb some of the great flavors created in this hearty sauce. Contrary to tradition, I finished this dish with fresh cilantro. The cilantro plays so well with flavors like tomato, pepper, onion and chili flake as well as naturally cool the mouth. If cilantro is not your thing, some fresh basil or Italian flat-leaf parsley would be a great finish for this dish as well. In a medium sauce pot, heat 1 Tbsp olive oil over medium-high heat. Add onion, bell peppers and garlic. Reduce heat to medium and stir until onions are translucent. Add crushed tomatoes, basil and chili flakes. Cook over high heat until boiling, then reduce heat to low and simmer covered for 1 hour. Add salt and pepper to taste. Cook linguine pasta according to directions in a large pot. Pasta should be cooked to al dente or a bit under, the pasta will continue to cook in the sauce. Drain pasta and return to pot. Add two cups Fra Diavolo sauce over pasta, cook on low heat for 2-3 minutes until pasta is cooked. Simultaneously, heat a medium skillet over high heat, add shrimp, a pinch of salt and pepper and cook until they start to turn pink. Add one cup of sauce to shrimp and simmer until shrimp are cooked thoroughly and opaque. 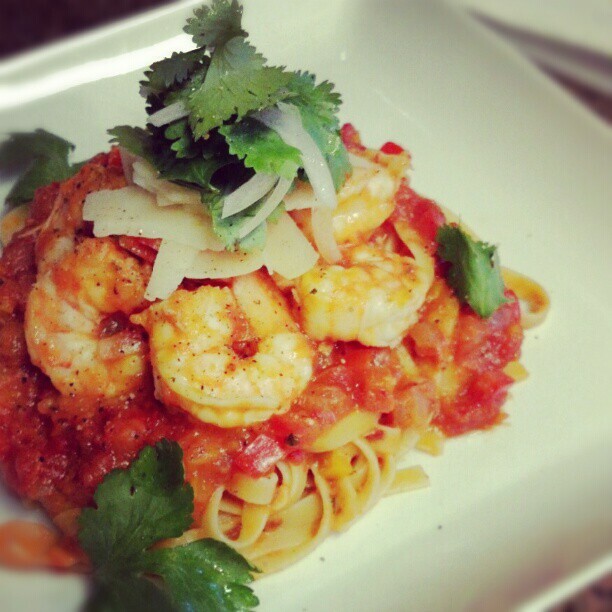 Plate pasta in a shallow bowl, top with a hearty spoonful of remaining sauce, shrimp and garnish with cilantro. The result is a full bodied pasta dish, certain to warm you up on any chilly day. Serve pasta in shallow bowls. Be sure to add another spoonful of sauce over the pasta as well. Add shrimp and garnish with cilantro to finish. Today was a cold rainy day and I was craving something warm and comforting. Naturally I think of Italian food, as I grew up with a lot of it as a child. With that in mind, I decided to make stuffed shells with a simple marinara sauce. I kicked my normal spinach and ricotta stuffed shells up a notch with some sweet Italian sausage. Now it's a meal. Here I will give you the recipe for my simple marinara sauce that tastes more complex than it is. Also, how to make the filling for the shells. First start by finely chopping the entire onion and the five peeled cloves of garlic. Heat a medium-sized sauce pan over medium heat, drizzle 1 TB olive oil into pan. Add onion and garlic and "sweat" until onions are translucent. Add white wine and turn heat to high, reducing the white wine by half. Add small can tomato paste and large can organic tomatoes. Bring to boil, then turn heat to low. Add 4 TB chopped fresh basil and oregano. Simmer for at least 1 hour. Season with salt and pepper to taste. If sauce is a bit bitter, add 2 tsp sugar. Cook shells according to box. Leave them a bit al dente as they will cook more in the oven. Finely chop medium onion. Saute onion in a large saute pan with olive oil. Add the sausage to the pan, cook and crumble. Hold sausage on the side and let cool. Beat one egg in a small bowl. Add ricotta cheese to a large bowl and add egg, mix thoroughly. Add spinach, basil, oregano, parmesean, 3/4 cup mozzarella cheese and Italian sausage to ricotta. Mix thoroughly. Season with 1 tsp salt and fresh cracked pepper. Fill each shell with ricotta mixture. 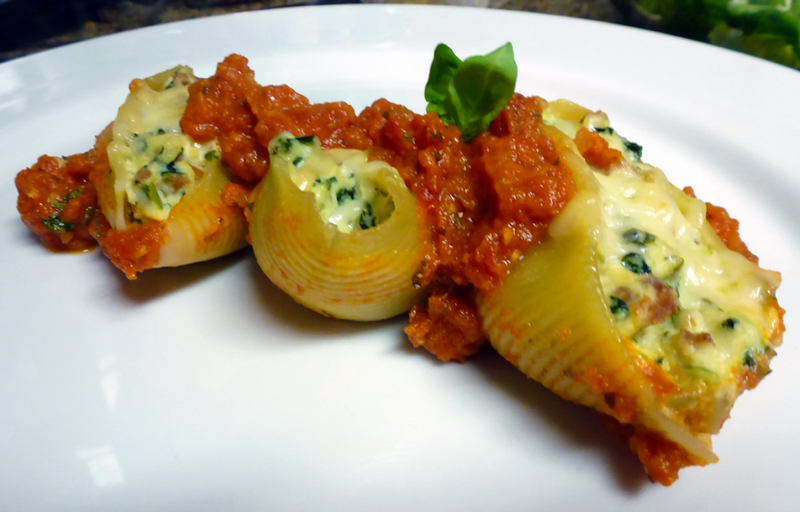 Fill shallow baking dish with layer of simple marinara sauce then place the shells into the dish. 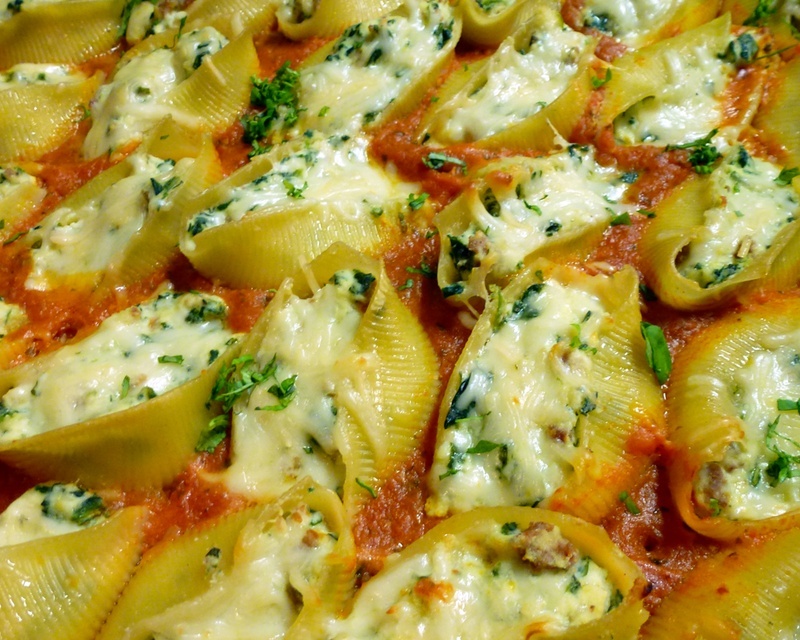 Top each shell with remaining mozzarella cheese. Bake at 350 for 45 minutes until bubbling and filling has set. 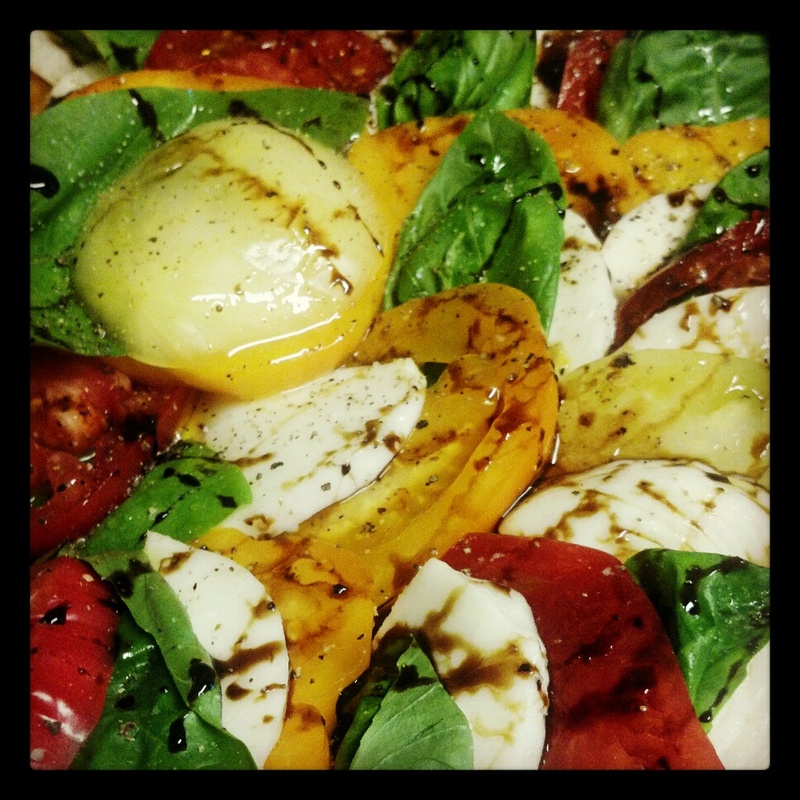 Simple traditional Italian salad consisting of heirloom tomatoes, fresh mozzarella and balsamic reduction. Great as a starter, or a side salad, this recipe is sure to compliment any Italian meal. Cut heirloom tomatoes into thick slices. Balsamic Reduction: Take one 750ml bottle of balsamic vinegar and place into small sauce pan. Cook over low heat until the reduction coats the back of a spoon. Store in a jar or squeeze bottle sealed with plastic wrap to retain freshness. Alternate tomato slice, mozzarella, basil. Tomato slice, mozzarella, basil. Until you have created a large circle. Once plating is completed, drizzle balsamic reduction and olive oil over salad. Season with salt and fresh cracked pepper. 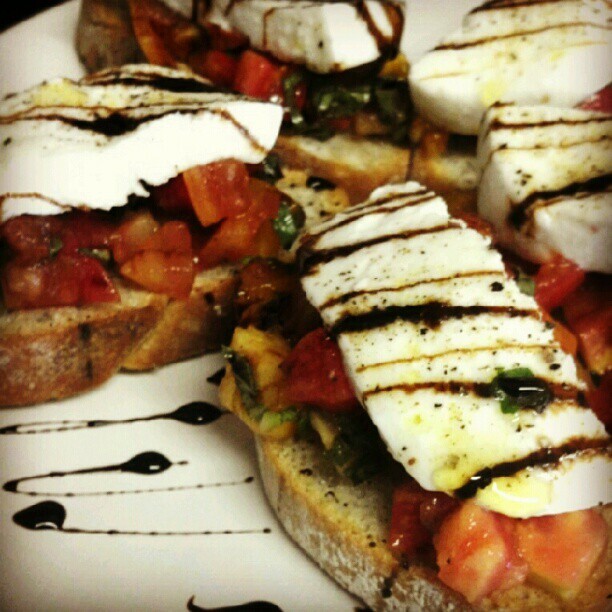 A combination of two of my favorite Italian appetizers, bruschetta and caprese. Chopped heirloom tomatoes are marinated with balsamic and basil then served on a crispy ciabatta crostini. The best part is the slice of tangy bufula mozzarella on top. Bufula mozzarella is created with buffalo milk, rather than cow's milk. Finish this appetizer with a drizzle of balsamic reduction, sea salt and fresh cracked pepper. Fresh and delicious! Heat oven to 350 degrees. Slice ciabatta loaf into 1/4 inch thick slices and brush with olive oil. Put slices onto sheet tray, making sure not to crowd the slices. Bake for 12-15 minutes until crispy. Wash, dry and chop heirloom tomatoes. Place tomatoes in a bowl along with 1 TB chopped basil, and 1 tsp balsamic vinegar and sprinkle of salt + pepper. Mix well, taste and adjust seasoning to your liking. Gently remove mozzarella from package, dry well with paper towels. slice with a sharp knife into thin slices. Spoon about 2 TB of bruschetta mixture onto each crostini. Top with one slice of bufufla mozzarella. Drizzle with balsamic reduction and olive oil. Sprinkle with sea salt and fresh cracked pepper. A super fresh, super simple appetizer!